Human systems have reshaped ecosystems across the terrestrial biosphere. Anthrome ecology reflects the rich and diverse ecological forms created and sustained by direct interactions with human systems, spanning a broad ecological spectrum, from Wildlands to Dense Settlements. Net Primary Productivity (NPP) varies in response to tree and vegetation cover, irrigation, fertilizer use, tillage and other management interventions and their results. 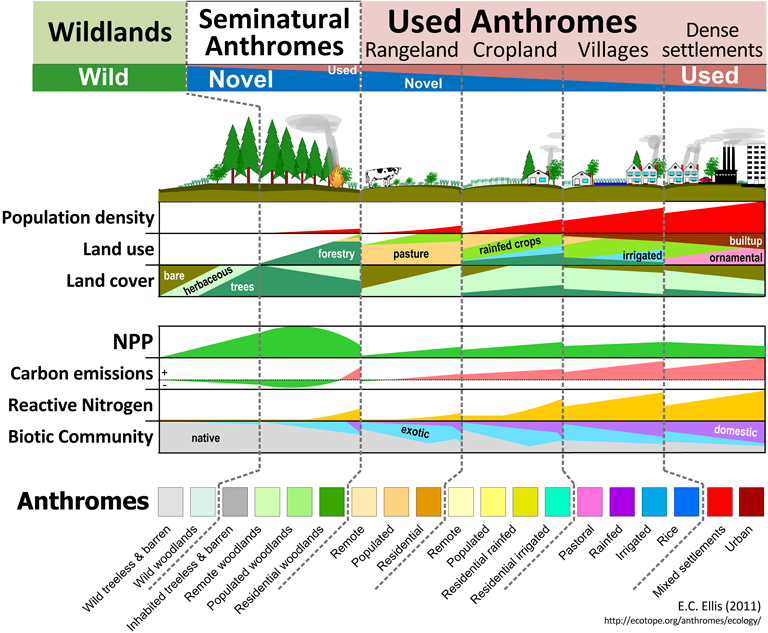 Biotic Communities vary from native patterns to novel ecosystems as they are transformed by domesticates (crops, livestock, ornamentals, pets, native cultivation), and invasions of exotic species, as well as habitat fragmentation, population harvest and management and the transformation of land to agricultural lands and settlements. Carbon Balance (emissions below) and Reactive Nitrogen are strongly influenced by clearing and planting of trees and vegetation cover, fertilizer use, tillage and other management interventions.